Size of Male: 8-11 lbs., 9-10 in. Size of Female: 8-11 lbs., 9-10 in. The Silky Terrier is not to be underestimated. It may be a toy dog in size, but it is by heart larger than it looks. In addition to a resilient personality, the feisty and inquisitive pooch sports rodent killing instincts and a gorgeous silky steel-bluish coat that’s as fine as human hair. The 19th century interbreeding of two “silkies” produced what you know today as the Silky Terrier: the Yorkshire Terrier which came to Australia by way of England (“yorkies”) and the native Australian Terrier (“Aussies”). 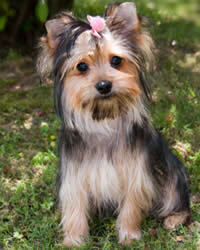 Following a failed attempt to designate the smooth-haired and rough-haired varieties as separate breeds, the dogs were called “Sydney or Australian Silky Terriers” for a time. The geographical prefixes were eventually dropped just before the dogs received official American Kennel Club recognition in 1959. Dainty is not a word that aptly describes this dog breed. In fact, you can very well expect the exact opposite. The tiny pooches are surprisingly territorial, playful and bold. They love to chase cats, dig, bark and romp around ? and they will certainly change the way you view toy dogs. Because they are fine-boned, they are better left to the company of older and gentler children. Many of these dogs may be hostile around other canines. Living Environment – The dog is tailored for indoor life and requires only a few hours of stretching or exercising in the open air. Space isn’t a major issue. What’s important is that your home offers socialization and interaction. They are not recommended for individuals who are always out. Yards, if any, must be securely fenced for the safety of your pet and any possible enemies. To thwart escape attempts, you may want to invest in solid wood fencing. These wooden pens are less scalable than the regular chain links and wires. Grooming – Expect average work in the grooming department. Although they are low shedders, these tiny terriers possess coats that are quick to mat and require daily brushing. Regular shampooing is necessary, as well as trimming around bottom areas. Diet & Exercise – Experts and pet owners are divided between serving high-quality commercial food and cooking meals for this dog breed. They do share the same opinion on food choices that are best avoided: salty food, table scraps, horse meat, beef and corn. In terms of exercise needs, this particular toy breed is slightly more demanding than other toy dogs. You can give your dog a treat by allowing the pooch to sniff around and roam leash-free in a securely fenced pen. Health – This dog breed enjoys a relatively long lifespan. There aren’t any major health concerns, but at the minor level you must watch out for the emergence of dog allergies, luxating patella, epilepsy and Legg Perthes. Extra caution should be practiced when putting on their collar as these little dogs have delicate tracheas. As with most toy dog breeds, these little pooches can be quite tough to train and housebreak. They respond better to positive dog training methods. With the right balance of respect training and motivation, they can turn out to be a darling in obedience exercises.